Use of a soldering iron to desolder a contact. Soldering is a high-temperature method of joining metallic surfaces using a filler material called a solder. A solder is a metal alloy with a melting temperature below 450°C (842°F). The word solder comes from the Middle English word soudur, via the Old French soldure and soulder, from the Latin solidare, meaning '‘to make solid’'. In a soldering process, heat is applied to the parts to be joined, causing the solder to melt and be drawn into the joint by capillary action and to bond to the materials to be joined. After the metal cools, the resulting joints are not as strong as the base metal, but they have adequate strength, electrical conductivity, and water-tightness for many uses. Soldering is distinguished from brazing in that soldering involves the use of a lower melting-temperature filler metal. It is distinguished from welding in that the base metal is not melted during the joining process. Soldering is an ancient technique that has been used practically as long as humans have been making items out of metal. Today, the most frequent application of soldering is assembling electronic components on printed circuit boards (PCBs). Another common application is making permanent but reversible connections between copper pipes in plumbing systems. Joints in sheet-metal objects such as food cans, roof flashing, drain gutters, and automobile radiators have also historically been soldered, and occasionally still are. Jewelry and small mechanical parts are often assembled by soldering. Soldering is used to join lead came and copper foil in stained glass work. Soldering can also be used to effect a semi-permanent patch for a leak in a container or cooking vessel. As technology advances and electronic devices are combined on smaller boards and chips, the use of soldering for electronic goods is diminishing. Nonetheless, soldering will probably continue to be used in various manufacturing processes because it is inexpensive and easy to use. In addition, it is a valuable method for making prototypes and experimental devices, because solder can be readily removed. It is likely that simpler and more economical ways of soldering may be developed. Soldering can be done in a number of ways, including passing parts over a small fountain in a bulk container of molten solder (wave soldering), heating assemblies by use of an infrared lamp, or by using a point source such as an electric soldering iron, a brazing torch, or a hot-air soldering tool. Recently, reflow soldering is used almost exclusively for PCB assembly, sometimes followed by a wave-soldering or hand-soldering operation for oddly sized/shaped components. Though the base material is not melted in a soldering process, some of the base material's atoms do dissolve into the liquid solder. This dissolution process enhances the soldered joint's mechanical and electrical characteristics. A "cold solder joint" with poor properties may result if the base metal is not heated adequately to thoroughly melt the solder and cause this dissolution process to occur. Note that the distinction between soldering and brazing is arbitrary, with the only difference being the melting temperature of the filler material. A temperature of 450°C is usually used as a practical cutoff. Different equipment or fixturing is usually required, because (for instance) most soldering irons cannot achieve high enough temperatures for brazing. Practically speaking, there is a significant difference between the two processes: brazing fillers have far more structural strength than solders, and are formulated for this purpose rather than for maximum electrical conductivity. Brazed connections are often as strong or nearly as strong as the parts they connect, even at elevated temperatures. "Hard soldering" or "silver soldering" (performed with high-temperature solder containing up to 40 percent silver) is also often a form of brazing, since it involves filler materials with melting points near or higher than 450°C. Although the term "silver soldering" is used more often than "silver brazing," the former term may be technically incorrect depending on the exact melting point of the filler in use. Solders are available in many different alloys for differing applications. Traditionally, the eutectic alloy of 63 percent tin and 37 percent lead (or a ratio of 60/40, which is almost identical in performance to the eutectic) has been the alloy of choice for most copper-joining applications. A eutectic formulation has several advantages for soldering. Chief among these is the coincidence of the liquidus and solidus temperatures—that is, the absence of a plastic phase. This allows for quicker wetting out as the solder heats up, and quicker setup as the solder cools. A non-eutectic formulation must remain still as the temperature drops through the liquidus and solidus temperatures. Any differential movement during the plastic phase may result in cracks, giving an unreliable joint. Additionally, a eutectic formulation has the lowest possible melting point, which minimizes stress on components during the soldering process. For environmental reasons, 'no-lead' solders are being more widely used. Unfortunately, most 'no-lead' solders are not eutectic formulations, making it more difficult to create reliable joints with them. See complete discussion below. Other common solders include low-temperature formulations (often containing bismuth), which are often used to join previously-soldered assemblies without un-soldering earlier connections, and high-temperature formulations (usually containing silver) which are used for high-temperature operation or for first assembly of items which must not become unsoldered during subsequent operations. Specialty alloys are available with properties such as higher strength, better electrical conductivity and higher corrosion resistance. In high-temperature metal joining processes (welding, brazing, and soldering), the primary purpose of the flux is to prevent oxidation of the base and filler materials. For example, tin-lead (SnPb) solder attaches very well to copper, but poorly to the various oxides of copper, which form quickly at soldering temperatures. Flux is a substance that is nearly inert at room temperature but becomes strongly reducing at elevated temperatures, preventing the formation of metal oxides. Secondarily, flux acts as a wetting agent in soldering and brazing processes. A flux must be properly selected for the process; a soldering flux will vaporize and have no effect at the high temperatures used for welding. For hand-soldering operations, 'flux-core' solder is often used. The solder is formed into a small tube, with a liquid flux in the center. Flux is automatically delivered in the appropriate quantity as the solder is used. Similarly, brazing rods are usually available with a coating of solid flux. Traditionally, soldering fluxes have required post-process removal due to their chemical activity, which would eventually erode the base material and result in an unreliable connection. This required the use of alcohol or other volatile solvents, which typically resulted in pollution of the air and/or the environment. Fluxes currently available include water-soluble fluxes (that do not need volatile organic compounds (VOCs) for removal) and 'no-clean' fluxes, which are mild enough to not require removal at all. Performance of the flux needs to be carefully evaluated—a very mild 'no-clean' flux might be perfectly acceptable for production equipment, but not give adequate performance for a poorly controlled, hand-soldering operation. In some modern processes, an inert gaseous environment is used which doesn't support oxidation. These processes can obviate the need for flux. A tube of multicore electronics solder used for manual soldering. The flux is contained in five cores within the solder itself. All solder pads and device terminals must be clean for good wetting and heat transfer. The soldering iron or gun must be clean and pre-tinned (pre-coated) with solder—otherwise, components may heat up excessively due to poor heat transfer. The devices must then be mounted on the circuit board properly. One technique is to elevate the components from the board surface (by a few millimeters) to prevent heating of the circuit board during circuit operation. After device insertion, the excess leads can be cut, leaving only a length equal to the radius of the pad. One may use plastic mounting clips or holders for large devices to reduce mounting stresses. General directions for the procedure are as follows (although details may vary according to the application): Heat sink the leads of sensitive devices to prevent heat damage. Apply soldering iron or gun to both terminal lead and copper pad to equally heat both. Apply solder to both lead and pad but never directly to the tip of soldering iron or gun. Direct contact will cause the molten solder to flow over the gun and not over the joint. The moment the solder melts and begins to flow, remove the solder supply immediately. Do not remove the iron yet. The remaining solder will then flow over the junction of the lead and pad, assuming both are free of dirt. Let the iron heat the junction until the solder flows and then remove the iron tip. This will ensure a good solid junction. Remove the iron from the junction and let the junction cool. Solder flux will remain and should be removed. It is important not to move the joint while it is cooling—doing so will result in a fractured joint. Also, do not to blow air onto the joint while it is cooling, but to let it cool naturally, which occurs fairly rapidly. A good solder joint is smooth and shiny. The lead outline should be clearly visible. Clean the soldering iron tip before beginning on a new joint. It is absolutely important that the iron tip be free of residual flux. Excess solder should be removed from the tip. This solder on the tip is known as "keeping the tip tinned." It aids in heat transfer to the joint. After finishing all the joints, remove excess flux residue from the board using alcohol, acetone, or other organic solvents. Individual joints can be cleaned mechanically. The flux film fractures easily with a small pick and can be blown away with canned air. In solder formulations with water-soluble fluxes, sometimes pressurized carbon dioxide or distilled water are used to remove flux. 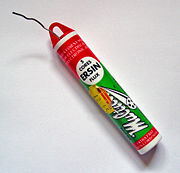 Traditional solder for electronic joints is a 60/40 tin/lead mixture, with a rosin-based flux that requires solvents to clean the boards of flux. Environmental legislation in many countries, including the entire European Community, have led to a change in this formulation. Water-soluble, rosin-free fluxes have been increasingly used since the 1980s, so that soldered boards can be cleaned with water or water-based cleaners. This eliminates the use of hazardous solvents in the production environment. More recently environmental legislation has specifically targeted the wide use of lead in the electronics industry. According to the European Union's Waste Electrical and Electronic Equipment Directive (WEEE) and Restriction of Hazardous Substances Directive (RoHS), lead had to be eliminated from electronic systems by July 1, 2006, leading to much interest in lead-free solders. Many new technical challenges have arisen with this endeavour. For instance, traditional lead-free solders have a significantly higher melting point than lead-based solders, which renders them unsuitable for use with heat-sensitive electronic components and their plastic packaging. To overcome this problem, solder alloys with a high silver content and no lead have been developed with a melting point slightly lower than traditional solders. Lead-free construction has also extended to components, pins, and connectors. Most of these pins used copper frames, and either lead, tin, gold or other finishes. Tin finishes are the most popular of lead-free finishes. Nevertheless, this brings up the issue of how to deal with tin-whiskers—that is, the slow growth of slender crystals of tin from the solder joint. These whiskers can form a bridge that creates a short circuit years after a device has been manufactured. Somehow, the current movement brings the electronics industry back to the problems solved in the 1960s by adding lead. The JEDEC Solid State Technology Association (once known as the Joint Electron Device Engineering Council) has created a classification system to help lead-free electronic manufacturers decide on the kinds of provisions they want to take against whiskers, depending upon the type of application involved. Historically soldering tips were copper, placed in braziers. One tip was used; when the heat had transferred from the tip to the solder (and depleted the heat reserve) it was placed back in the brazier of charcoal and the next tip was used. Currently, electric soldering irons are used; they consist of coil or ceramic heating elements, which retain heat differently, and warm up the mass differently, internal or external rheostats, and different power ratings—which change how long a bead can be run. It is sometimes necessary to use solders of different melting points in complex jobs, to avoid melting an existing joint while a new joint is made. Copper pipes used for drinking water should be soldered with a lead-free solder, which often contains silver. Leaded solder is not allowed for most new construction, though it is easier to create a solid joint with that type of solder. The immediate risks of leaded solder are minimal, because minerals in municipal or well-water supplies almost immediately coat the inside of the pipe, but lead will eventually find its way into the environment. Tools required for pipe soldering include a blowtorch (typically propane), wire brushes, a suitable solder alloy, and an acid paste flux, typically based on zinc chloride. Such fluxes should never be used on electronic parts or with electronics tools, because they can lead to corrosion of the delicate electronic parts. Soldering defects are solder joints that are not soldered correctly. These defects may arise when solder temperature is too low. When the base metals are too cold, the solder will not flow and will "ball up," without creating the metallurgial bond. An incorrect solder type (for example, electronics solder for mechanical joints or vice versa) will lead to a weak joint. An incorrect or missing flux can corrode the metals in the joint. Without flux the joint may not be clean. A dirty or contaminated joint leads to a weak bond. A lack of solder on a joint will make the joint fail. An excess of solder can create a "solder bridge" which is a short circuit. Movement of metals being soldered before the solder has cooled will make the solder appear grainy and may cause a weakened joint. Soldering defects in electronics can lead to short circuits, high resistance in the joint, intermittent connections, components overheating, and damaged circuit boards. Flux left around integrated circuits' leads will lead to inter-lead leakage. It is a big issue on surface mount components and causes improper device operation as moisture absorption rises, In mechanical joints defects lead to joint failure and corrosion. In electronics, solders are usually 60 percent tin and 40 percent lead by mass in order to produce a near-eutectic mixture (lowest melting point—below 190°C [374°F]). These are commonly designated Sn60/Pb40. The eutectic ratio of 63/37 corresponds closely to a Sn3Pb intermetallic compound. In plumbing, a higher proportion of lead was used. This had the advantage of making the alloy solidify more slowly, so that it could be wiped over the joint to ensure watertightness. Although lead water pipes were displaced by copper when it was realized that the lead was poisonous, lead solder was still used until the 1980s because it was thought that the amount of lead that could leach into water from the solder was negligible. Since even small amounts of lead have been found detrimental to health, lead in plumbing solder was replaced by copper or antimony, with silver often added, and the proportion of tin was increased. As used for brazing, is generally a copper/zinc or copper/silver alloy, and melts at higher temperatures. Eutectic solder has the lowest melting point for solders, which is 360°F. In silversmithing or jewelry making, special hard solders are used that will pass assay. They contain a high proportion of the metal being soldered and lead is not used in these alloys. These solders also come in a variety of hardnesses, known as 'enameling', 'hard', 'medium', and 'easy'. Enameling solder has a high melting point, close to that of the material itself, to prevent the joint desoldering during firing in the enamelling process. The remaining solder types are used in decreasing order of hardness during the process of making an item, to prevent a previously soldered seam or joint desoldering while soldering a new joint. Easy solder is also often used for repair work for the same reason. Flux or rouge is also used to prevent joints desoldering. Solder often comes pre-mixed with, or is used with, flux, a reducing agent designed to help remove impurities (specifically oxidized metals) from the points of contact to improve the electrical connection. For convenience, solder is often manufactured as a hollow tube and filled with flux. Most cold solder is soft enough to be rolled and packaged as a coil making for a convenient and compact solder/flux package. The two principal types of flux are (a) acid flux, used for metal mending; and (b) rosin flux, used in electronics, which avoids the corrosiveness of vapors that arise when acid flux is heated. Based on concerns over atmospheric pollution and hazardous waste disposal, the electronics industry has been gradually shifting from rosin flux to water-soluble flux, which can be removed with deionized water and detergent, instead of hydrocarbon solvents. Solder can occasionally splash, either because the flux has become superheated or because of contact with water in the cleaning sponge. It is therefore recommended that safety goggles be worn when soldering. Small solder splashes on the skin are painful, but they usually do not cause lasting harm. For large-scale work, additional protective clothing may be needed. A coil of lead-free solder wire. Lead-free solders contain tin, copper, silver, and sometimes bismuth, indium, zinc, antimony, and other metals in varying amounts. The lead-free replacements for conventional Sn60/Pb40 solder have higher melting points, requiring re-engineering of most components and materials used in electronic assemblies. Lead-free solder joints may produce mechanically weaker joints depending on service and manufacture conditions, which may lead to a decrease in reliability using such solders. "Tin whiskers" are another problem with many lead-free solders, as noted above. SnAgCu solders are used by two-thirds of Japanese manufacturers for reflow and wave soldering, and by about three-fourths of companies for hand soldering. SnAg3.0Cu0.5 (tin with 3.0 percent silver and 0.5 percent copper) has a melting point of 217-220°C and is predominantly used in Japan. It is the alloy recommended by JEITA (Japan Electronics and Information Technology Industries Association) for wave and reflow soldering, along with alternatives SnCu for wave soldering and SnAg and SnZnBi for reflow soldering. SnAg3.5Cu0.7 is another commonly used alloy, with a melting point of 217-218°C. SnAg3.5Cu0.9, with a melting point of 217°C, is determined by the National Institute of Standards and Technology (NIST) to be truly eutectic. SnAg3.8Cu0.7, with a melting point 217-218°C, is preferred by the European IDEALS consortium for reflow soldering. SnAg3.9Cu0.6, with melting point 217-223°C, is recommended by the U.S. NEMI (National Electronics Manufacturing Initiative) consortium for reflow soldering. SnCu0.7, with melting point of 227°C, is a cheap alternative for wave soldering, recommended by the NEMI consortium. SnZn9, with melting point of 199°C, is a cheaper alloy but is prone to corrosion and oxidation. SnZn8Bi3, with melting point of 191-198°C, is also prone to corrosion and oxidation due to its zinc content. SnSb5, tin with 5 percent of antimony, is the United States plumbing industry standard. Its melting point is 232-240°C. It displays good resistance to thermal fatigue and good shear strength. SnAg2.5Cu0.8Sb0.5 melts at 217-225°C and is patented by AIM alliance. SnIn8.0Ag3.5Bi0.5 melts at 197-208°C and is patented by Matsushita/Panasonic. SnBi57Ag1 melts at 137-139°C and is patented by Motorola. SnIn52 melts at 118°C and is suitable for the cases where low-temperature soldering is needed. Bismuth significantly lowers the melting point and improves wettability. In the presence of lead and tin, bismuth forms crystals of Sn16Pb32Bi52 with melting point of only 95°C, which diffuses along the grain boundaries and may cause a joint failure at relatively low temperatures. A lead-contaminated high-power part can therefore desolder under load when soldered with a bismuth-containing solder. Indium lowers the melting point and improves ductility. In the presence of lead, it forms a ternary compound that undergoes a phase change at 114°C. Zinc lowers the melting point and is low-cost. It is, however, highly susceptible to corrosion and oxidation in air. Zinc-containing alloys are therefore unsuitable for wave soldering, and zinc-containing solder pastes have shorter shelf life than zinc-free ones. 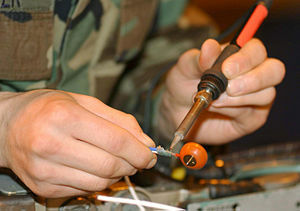 Solders can be removed using a vacuum plunger (on the right) and a soldering iron. In electronics, desoldering is the removal of solder and components from a circuit for troubleshooting and repair purposes. Electronic components are often mounted on a circuit board and it is usually desirable to avoid damaging the circuit board, surrounding components, and the component being removed. Specialized tools, materials, and techniques have been devised to aid in the desoldering process. Due to the dissolution of the base metals into the solder, solder should never be reused. Once the solder's capacity to dissolve base metal has been achieved, the solder will not properly bond with the base metal and a cold solder joint with a hard and brittle crystalline appearance will usually be the result. It is good practice to remove solder from a joint prior to resoldering—desoldering wicks or vacuum desoldering equipment can be used. Desoldering wicks contain plenty of flux that will lift the contamination from the copper trace and any device leads that are present. This will leave a bright, shiny, clean junction to be resoldered. The lower melting point of solder means it can be melted away from the base metal, leaving it mostly intact though the outer layer will be "tinned" with solder. Flux will remain which can easily be removed by abrasive or chemical processes. This tinned layer will allow solder to flow into a new joint, resulting in a new joint, as well as making the new solder flow very quickly and easily. ↑ A eutectic alloy consists of a mixture of components with a relatively sharp freezing or melting point. A non-eutectic alloy exhibits a plastic melting range. Soldering techniques for electronics manufacture. European Association for Brazing and Soldering - A detailed technical library and information about soldering and brazing. This page was last modified on 10 October 2015, at 15:56.